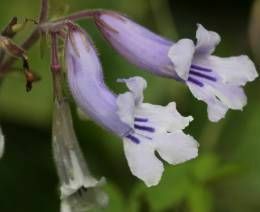 Streptocarpus fanniniae is a perennial creeping herb native to South Africa. The flowering stalk is up to 30 cm long. The corolla is honey-scented and hairy at the base of the floral tube. The flowers are deeply scented, with the colour varying from almost pure white to blue. The flowering shoots can grow up to 1 m tall.